At the end of March, I made some vanilla extract. You're supposed to strain the beans and vanilla caviar out after 6 months, I actually let mine go 7. I did use it all the time just pouring carefully after it went about 2 months. It's a dark gorgeous thick vanilla now, but I only have about half a cup left. I'm getting ready to start some more. So here's the original post. 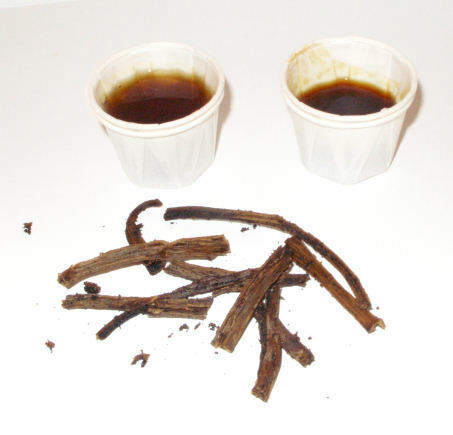 I got my vanilla beans from Vanilla Products USA extract grade beans. This wound up being about 80 beans from 5 (at the shortest, and only a couple of those) to 7 inch beans. Delivery was fast, I did a buy it now on March 17th and got them today. Communication was good. When I opened the vacuum sealed pouch, I was hit by an intense vanilla/bourbon smell. Yum yum. The beans were thin, but full of a nice dense caviar, and they were moist, out of the ones I rendered for my extract, I only hit one woody bean in the bunch. Bonus- they sent me 10 free Tahitian extract grade beans to try. It was 10.95 + 3.12 first class mail. So about 18¢ per bean, which is a really great price. So to make my extract, I used the method at Vanilla Review, he's got great instructions and takes vanilla super seriously. So I'm just going to give a quick overview and my math on it. I *can* use a lot of vanilla, I use lots more than most people I think, since the complexities of underrated vanilla never fail to thrill me. And because vanilla meringues toasted to just golden are as close to a guilt free cookie as you can get. So if you're not as much into vanilla and think less will do fine, just reduce measurements. VR recommends an ounce of beans per cup of liquid, and having 80 beans to 8 ounces roughly (I didn't weigh it) meant approximately 10 beans=1 ounce. I wanted a double strength or better vanilla extract. So..
(25.6-6)/8= 2.45, or roughly 2 and half cups of vodka. So for a single strength extract, that would be 25 beans, for my double strength thick extract, it would 50 beans. I sliced off the tops and bottoms of the beans with my sharp knife, and put them in the bottle, then I sliced them lengthwise and used the back of the knife to scrape the caviar out and put the caviar in the bottle, and cut up the pods into inch long pieces and put them in the bottle. And did that for 50 beans, which was time consuming, but if you're making a smaller amount,or just want a single strenth you wouldn't need to do that many. I really like vanilla. When I was done, I recapped the bottle (oh.. a nice easy screw cap!) and gave it a good shake. In 6 months, I'll strain out the beans, and decant it into smaller amber or green bottles and probably give away a few bottles to friends so my next batch can be made with Alaskan vodka. I'm planning to include a recipe for meringue cookies with it when I give away a couple bottles as gifts. It's supposed to be "done enough" after a month, but I want to let it go the full 6 months for the richness of flavor. A couple weeks before we strain the bean pieces out, we plan to make sugar crystals and then put the pieces in with them for a very fancy sugar for tea and coffee. Of course, my husband was very patient about the whole house smelling like vanilla. Because he rocks like that. I strained out the beans into a glass measuring cup using a strainer lined with a coffee filter. I had to shake the bottle quite a bit to get all the beans out, but I did. If you can find a large mouth dark glass jar that might work better, but the shaking time didn't take very long. The cup on the left holds a little bit of coffee the way I brew it. Too dark using dark roasted beans. The one on the right has my vanilla extract in it. So you can see how dark the vanilla extract is. Too bad you can't smell it. It's pretty amazing, my best friend wants some to use as perfume. Vanilla is expensive. Well, really, from the seller above, it's not very expensive. My husband who works in a large hotel doing a lot of purchasing was pretty surprised how inexpensively I bought my vanilla beans. But still, waste not, want not. I set the beans in a single layer in a glass baking pan and let them dry after straining them out of the extract. Some of them I mixed with a sugar free sweetener for my uncle. The flavor infuses the sweetener and adds a nice touch of vanilla to his tea, coffee and baking. Some went in my daughter's vanilla sugar jar. But I still had a lot left. So I tried grind a couple of the dried used vanilla beans into my coffee beans then brewing the pot normally. It turned out fantastic. The coffee has a nice vanilla flavor that tastes natural instead of having the chemical flavoring that some vanilla flavored coffee and so far all vanilla flavored creamer I've tried have. It's yummy. Time to get more vodka, but two bottles this time since I have an idea now how much vanilla I can use in 7 months. That way I'll have more to gift. Thank you for posting this! I can't find any pure extract to save my life and, in all honesty, was too afraid to try it on my own. I think I am going to go for it now! Thanks for the information. You may find this link fun and it includes a free printable label, not that you couldn't easily with your talents make one yourself. Oh, thank you for this!! I LOVE pure vanilla and it is very hard to find in the grocery store and might I add costs a million!! This will be SO much better. And the gift giving idea is great! What cook wouldn't LOVE a bottle for Christmas with a wonderful recipe. Can't wait to get started on my very own vanilla! Thank you again. Wow! When I've made my own vanilla in the past, I've just used a few beans per fifth of vodka. I think I'll go add some more to the bottle I have steeping right now. I used Everclear, because it was the highest percentage alcohol available, and like you, I don't drink. In fact, my mom always teases me about my "hooch" hiding in the closet steeping! Thanks for the info and the fun blog! I think you should share your vanilla meringue recipe with the world...especially those of us who are fellow vanilla lovers!